Sarah Hess Noname at the Jansport + Noisey Showcase, Cheer Up Charlies, 3/15/2017. Sarah Hess Noname the Jansport + Noisey Showcase, Cheer Up Charlies, 3/15/2017. Sarah Hess Noname at at the Jansport + Noisey Showcase, Cheer Up Charlies, 3/15/2017. Sarah Hess Tei Shi at the Jansport + Noisey Showcase, Cheer Up Charlies, 3/15/2017. Sarah Hess Hurray For the Riff Raff at the NPR Showcase, Stubbs, 3/15/2017. Sarah Hess PWR BTTM at the NPR Showcase, Stubbs, 3/15/2017. 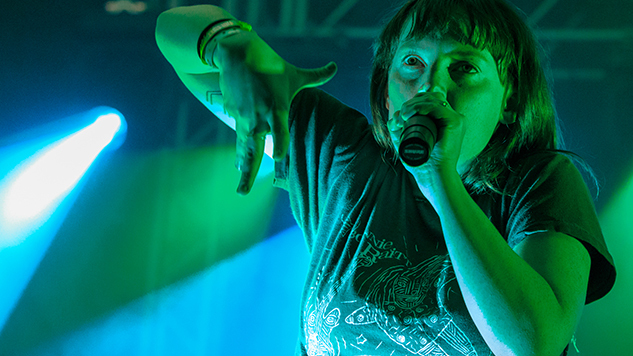 Sarah Hess Sylvan Esso at the NPR Showcase, Stubbs, 3/15/2017. Sarah Hess SXSW Day Two, 3/15/2017. Day 2 at SXSW was a big one for Paste and Daytrotter over at Same Sky Productions, where we hosted the likes of Wyclef Jean and Big Star’s Third ensemble. Miss it yesterday? Check out videos of those sessions here). But dividing and conquering is the name of the game this week, and those of us who weren’t posted up at the studio all day managed to take in plenty of sets across Austin on Wednesday. Check out images from Day 2 in the gallery, and read about some of the performances we caught on Wednesday below. And of course, stay tuned for more SXSW coverage all this week. “We have a new album coming out this summer, with a lot of songs that’re great for commercials. So if Mazda is listening…” singer Michelle Zauner joked during Japanese Breakfast’s set at the Mazda Studio at Empire showcase. I can always appreciate artists poking fun at the inescapable corporate hoopla at SXSW. Zauner delivered expansive and ambitious vocals in the band’s short set, from the great “Everybody Wants To Love You” to a cover of “Dreams” by The Cranberries. PWR BTTM was the best band I saw on Tuesday and it was an easy choice at the end of the day. I remember seeing them play a smaller showcase late into the night last year and it felt like a worthy coronation to see the queer punk band on the big stage at NPR’s showcase at Stubb’s tonight. Perhaps the most important band in the business, PWR BTTM has made it their priority to bring the voices of queer, gender neutral and anyone who’s just weird, depressed or unsure of themselves, to the forefront of our daily conversations. “This is another new song and it’s about teaching people how to use gender neutral pronouns if they haven’t before,” Ben Hopkins told the crowd. And it just brought a massive smile to my face, because their message is one of empowerment and understanding different lifestyles, while they’re out on stage shredding like hell. Hopkins and Liv Bruce—the core members of the duo, who had two other musicians on stage with them for this show—take turns switching off on lead vocals. New tongue-in-cheek single, “Answer My Text,” resonated brilliantly on-stage and the band played through feedback with dexterity, making it an integral part of their delivery. Plain and simple, this is a great band and as tight as a unit as you’ll find anywhere. The Brooklyn eight-piece had high energy at their 4pm set at Lustre Pearl, playing a combo of songs off of their upcoming third LP, Belong, (out April 7th on Downtown/Interscope) and favorites like “Sonsick,” “Emily” and “Parasites.” The most notable growth in San Fermin’s live performance, came in the form of lead singers Charlene Kaye and Allen Tate—both coming off worthy solo debut record —just vocally flexing like nobody’s business.